This year, I discovered the BAM CAL on Ravelry. That is: Block-A-Month Crochet-A-Long. Several days before the new year, I was out yarn shopping, and pick up 3 shades of Caron Simply Soft to work the coming year's blocks in. Then Tricia (Crunchy Catholic Momma) mentioned wanting to do a stash bash for the coming year, and I'm all like crap, can I not buy new yarn for the whole year? I decided I would take it one step at a time, and right now, my goal is no new yarn until March. I will re-assess my stash at that point, and see if I need another 3 month yarn diet- and I'll do this every 3 months, until my stash is significant reduced (or the end of the year, not sure which). 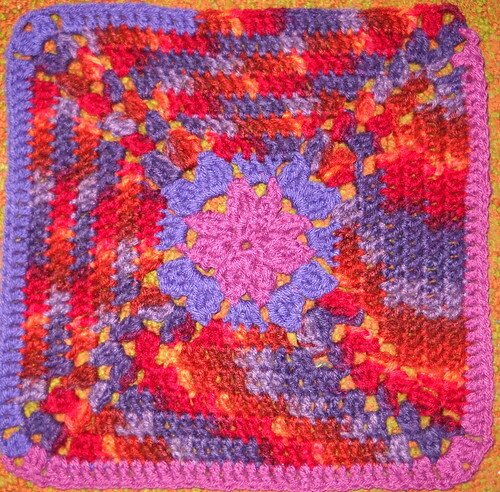 So, inspired by all the crocheters at the BAMCAL, I decided to do a stash busting afghan along with my other one. My mom was so confused by it, because she thought I was putting all the squares in the same afghan. I'll probably have to explain it to her again next month, and so on. The pattern is Drop in the Bucket by Janie Herrin. I love it, because it gives me some ideas for creating a square with a circle center. 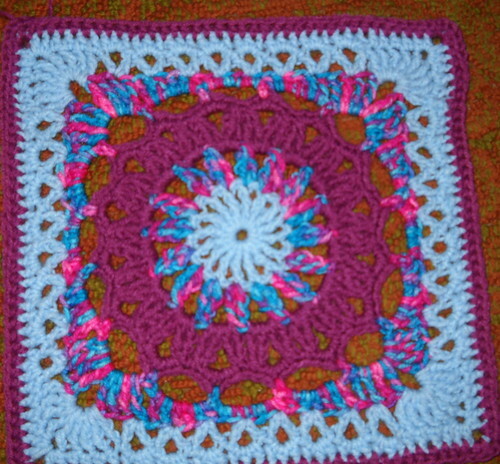 Also, this square helped me use up my first bit of stash- I don't have much more than 3 feet of the baby blue color left. I saved it to go into another stash busting project- Christmas Stockings! I hope to make more of these as the year progresses- I made one at the end of last year, and I really like how it turned out. The pattern is Pretty Petals, by Melinda Miller. I absolutely love her patterns, and have several more printed out to work up for the Stash Bash as the year goes on. Now, go back up to the top of the page, and head over to Tricia's page to see other inspiring stories of our stash bashing adventure! First, the square is gorgeous. Second, thanks for the heads up on the BAM CAL. I just joined the group--it sounds like a lot of fun!